375 p., 15,6 x 20,9 cm. With contributions by Wolfgang Bartuschat, Claudio Cesa, Walter E. Ehrhardt, Horst Folkers, Volker Gerhardt, Hermann Klenner, Domenico Losurdo, Hans-Martin Pawlowski, Renato Pettoello, Hans Jörg Sandkühler, Wolfgang Schild, Wolfdietrich Schmied-Kowarzik, Josef Simon, Stefan Smid and Rainer Specht. Not only did Schelling emphasize the connection between commitment and freedom, he also stressed the extent to which freedom was rooted in faith. The law serves freedom, but the fact that freedom has been assigned to us as a task does not originate in the law itself as the law but rather in sources which it does not have at its disposal and for reasons of freedom also cannot have at its disposal. 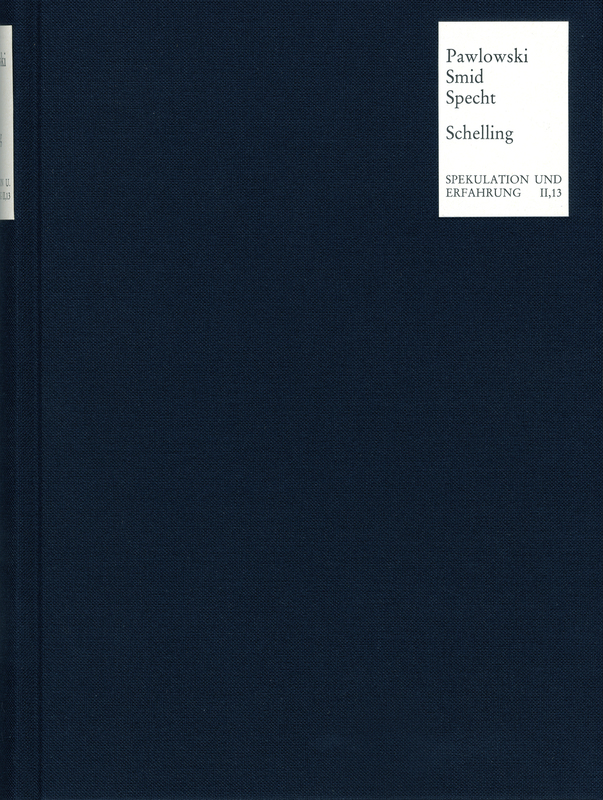 This volume combines the literary results of the Schelling conference in Mannheim. This took place during an informal meeting of Mannheim scholars whose goal was to talk about Schelling’s justification of the law.